1.Process the onion, green chillies, garlic and root ginger in a food processor until finely chopped. 2.Finely grate the potatoes and rinse thoroughly with water. Squeeze out as much water as possible by squeezing the grated potato in a sieve or clean tea towel. 3.In a large bowl, combine the onion mixture and the potatoes with the mince and the remaining ingredients. Mix well. Cover, and leave in the refrigerator for a couple of hours or overnight. 4.Take handfuls of the mixture and wrap around each skewer in the shape of a sausage. Place on your Black Knight Barbecue once the charcoal has ashed over. Turn over once whilst cooking. 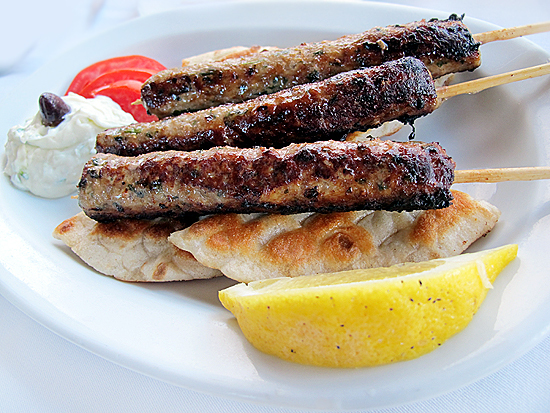 Kebabs are done when both sides are crisp and browned, and when juices run clear. 5.Serve hot with slices of onion and lemon wedges.